Information and vendor booths covering a wide variety of outdoor recreational activities for the individual or family. Plus, information on local businesses and services. Breakfast and lunch will be available! For vendor information, call Mary Hirst at (814) 435-2218. For information about the show call (570) 923-2386 or email [email protected] $3.00, Children under 12, free. Celebrating the late, great, Robin Williams by master impressionist, Roger Kabler. Tickets $25, Seniors $22. Brought to you by the Wellsboro Community Concert Association, this concert will feature piano, trumpet, flugelhorn, and french horn. Members of the Tiadaghton Audubon Society will lead this series. Meet prior to 8:00 a.m. and promptly drive to a nearby starting location in the park. Saturdays from April 6 through May 25. 8:00 a.m. until 10:00 a.m. Kids from toddlers to age 16 are invited to take part in a day of fishing fun. Lots of enjoyment catching trout donated by the Potter County Anglers Association. Austin Dam Association will be offering food and beverages. (Please don't bring food/coolers.) Kids eat lunch for free! Registration is free and begins at 11:00 a.m. The History Comes Alive series continues. Learn about Ida Tarbell, the pioneer investigative journalist who took on standard oil. Presented by Carole Hall. Dozens of antique vendors selling a wide variety of items; sawmill demonstration on Saturday, and birch still and blacksmith demonstrations all weekend; food available for purchase in the program room. 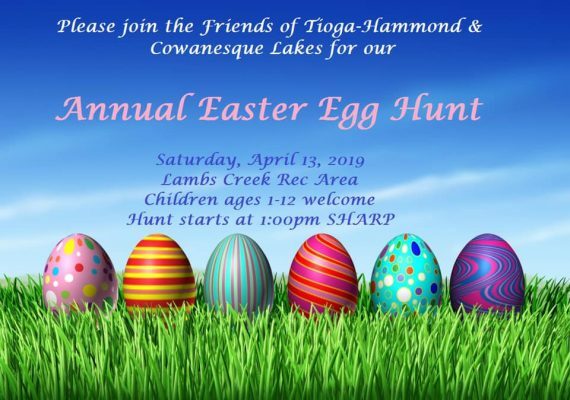 The Friends of Tioga-Hammond and Cowanesque Lakes invite children ages 1 through 12 to join in the fun. Hamilton-Gibson Productions presents the Eleanor Roosevelt High School Chamber Choir and the Hamilton-Gibson Youth Choir in concert! April 13 at 7:30 p.m. at the Wellsboro Area High School. Sponsored in part by the Penn Wells Hotel and Lodge. For more information, call (570) 724-2079 or visit hamiltongibson.org.